Antica Casa Balsari has the unique atmosphere and comfort of a traditional Lago Maggiore historic house. Ideal place for relax and concentration, the house offers a community environment specifically for study groups of postgraduate university students, professionals as well as group seminars. 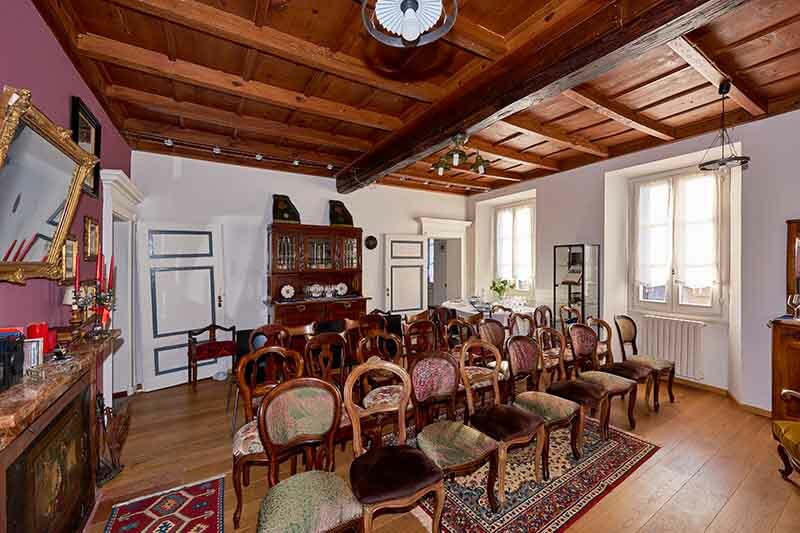 The house is a very peaceful and charming place that allows intellectual concentration, thanks to its private and enclosed Italian garden as well as to its wide choice of books and music. The garden itself offers areas dedicated to rest and reading with two porches equipped with libraries and tables to study. The Old Pharmacy has been transformed in two comfortable libraries. Antica Casa Balsari has different facilities for meetings or group purposes. FLAT SCREEN TV 40” and DVD are at disposal. The house has no lift . For disabled visitors the choice must be on the ground floor Rossini flat. Even for Rossini flat, wheelchairs will have problems in the bathrooms. The house offers 7 flats with a total of 11 single and double bedrooms, from 22 to a maximum of 34 beds . Exceptional fully-furnished accommodation with kitchen and living room , libraries, music and internet wifi. Apartments are ideal for group stays, promoting cooperation and sharing common activities while ensuring each participant’s privacy. As self-catered accommodation, every flat has its own kitchen and participants can cook by themselves. A common dining room is at Vivaldi flat. Catering for groups can be supplied on demand. All rooms have towels, duvet, pillow, bedlinen at disposal, kitchens are well equipped. On-site laundry facilities and laundrette in the Square. Car parking and bicycle storage. Drugs and the use of illegal substances not allowed. The combination of INDOOR learning places with OUTDOOR activities in the Lago Maggiore and Piemonte areas – fells, rivers, forests, lakes and mountains – means that you can combine lectures with hands-on teaching in the field that allows a suggestive practical experience. For those who enjoy sports the area offers a wide range of sporting activities. In town there are riding schools, golf clubs , go-kart tracks. At 1 km from home, the Bosco Solivo Forest with walking and running facilities. Partner suppliers available to rent professional bikes for the tours of the lakes. Main important golf courses are Golf Arona (Borgo Ticino), Golf Club Castelconturbia (Agrate Conturbia), Golf Club Bogogno, Golf des Iles (Stresa). A few kilometers near Antica Casa Balsari water sports facilities. In winter you can reach the ski resorts of Mottarone and San Domenico. At only 1 hour and 30 , Alagna Monte Rosa , the Paradise of freeride . Borgo Ticino has a good offer of local bars, cafés and restaurants. A few meters from the house the town boasts a selection of shops: grocery stores, bars, restaurants and pizzerias, the supermarket is about 500 meters. The village has a post office, two banks and medical services. 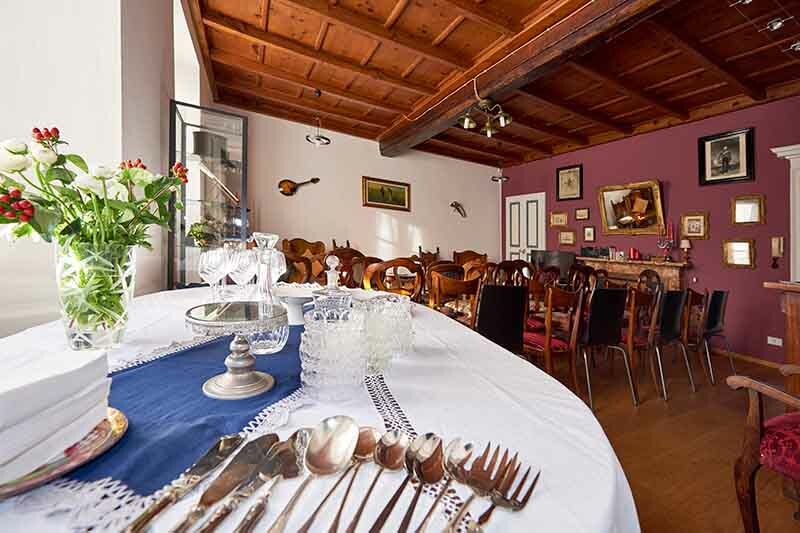 Antica Casa Balsari is at easy walking distance to both the railway station and the bus stop. MiniBus, bus, taxi service to Malpensa on request. Borgo Ticino is close to Malpensa Airport (only 17 km) that can be reached by bus service Malpensa Oleggio Borgo Ticino. At 9km in Arona there is the pier for the ferry. Experience a friendly and supportive learning environment !